This airplane mobile is unique in that is made from the scraps of other scrap projects! 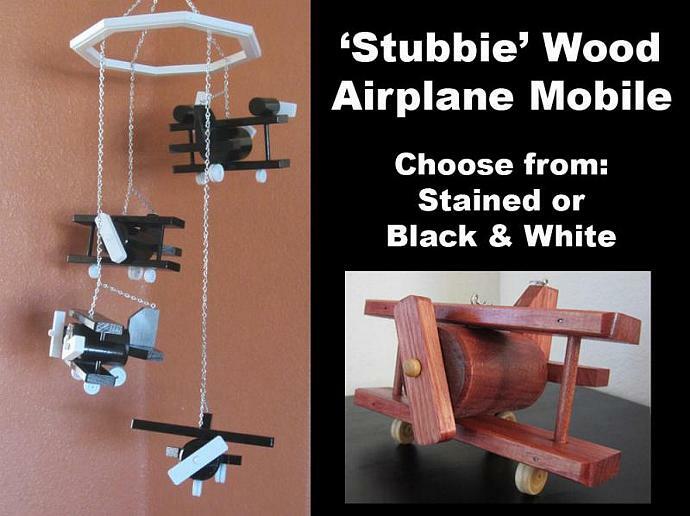 It's a whimsical alternative to my original airplane mobile. Features 4 different planes with propellers that will spin. Made from select pine scraps, each plane is sanded, stained or painted, then finished with 2 coats of varnish. 28.5" Height (total) - from the top of the wood frame to the bottom of the model is 24.5"
I'm happy to combine shipping if you purchase more than one of my pieces. Final cost depends on your specific interests. Please contact me for a quote.